A DVD movie is usually saved as a directory file structure within VIDEO_TS and AUDIO_TS folder. The VIDEO_TS folder contains main movies (.vob) and lots of system files (.ifo and .bup). • It would be an incredible terrific experience to make a copy of your home made DVDs to share with your family members or best friends of all your great happiness and memories. • DVD disc can easily get scratched after overuse, even a tiny scratch can make the DVD disc unusable. • Unwilling to be bored by limited returning time for the borrowed DVD disc while you haven’t finished watching or just wish to make a copy for viewing later. Brorsoft DVD Ripper is a very easy and powerful DVD ripping software tool, which can backup DVD main movie only to hard drive without any loss of quality, so that you can enjoy them anytime without DVD discs and DVD player. Superior support any kinds of DVD: Rip, copy and convert any kinds of DVD movies, has strong ability to remove all the restrictions like CSS, Region, RCE, Sony ARccOS and PuppetLock. Convert DVD to Various Formats: Support both HD and standard video format as output, More than 250+ formats listed to ensure you can get the desired video and audio types, like H.264, H.265/HEVC,AVI, MP4, WMV, FLV, MPEG, MOV, MKV, RMVB, FLAC, AAC, AC3, AIFF, AMR, M4A, etc. Convert 6X faster and keep excellent video quality: Grabs the NVIDIA® CUDA technologies, speeding up the conversion speed and lets you convert DVD movies in a flash while keeping the original high video quality. Directly Copy DVD without extras: Save 100% intact VOB main movie from your DVD Disc without any quality loss. 1:1 Full Disc Copy: Copy the entire disc in original file structure with all subtitle tracks and audio streams preserved. Download and install Brorsoft DVD Ripper FREE TRAIL version on your Windows (10) PC. Follow the guide to copy main movie from DVD step-by-step. For Mac users, please switch to Brorsoft DVD Ripper for Mac (compatible with macOS Sierra, turn to best DVD Ripper for macOS Sierra). Click “Format” bar, choose “Copy” >”Directly Copy” from the Format menu to copy the . vob files only which contains the main movie on your DVD disc. 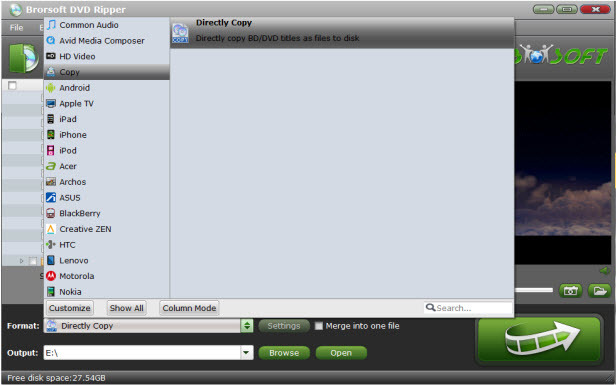 Finally, click “Convert” button to start lossless DVD Backup for Main Movie. When the copying work is done, you are able to click “Open” button to get the output .vob files without any other extra contents.